Make life a little easier with this family-friendly washing machine. 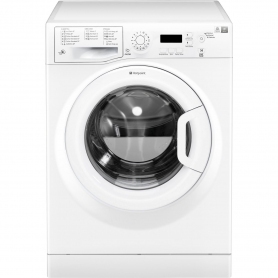 Remove stains and allergens, protect your delicates and save energy – all thanks to the Hotpoint WMEUF743P. Efficient and Spacious The 7 kg capacity drum on this model is roomy enough to clean large loads of laundry at a time, making it the perfect choice for families. Items like bed sheets and towels can fit in with ease, ensuring a clean and hygienic home with minimal hassle. The WMEUF743P is energy efficient too. Don’t worry about running up your electricity bills – this model is rated A+++ for electricity consumption. You can also use your tumble dryer a little less by spin drying your clothes. 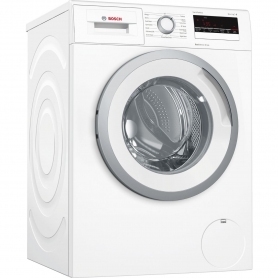 The 1400 RPM spin cycle removes more water than slower spins, for quicker drying times. With 16 programmes to choose from, there’s a cycle for every type of load. Whether you want to wash everyday coloured t-shirts and jeans, or a delicate silk evening dress, this machine offers a thorough wash without causing damage. Don’t be reluctant to throw knitwear in the washing machine any longer. The Woolmark Green awarded Wool cycle reduces stress placed on fragile fibres, and careful temperatures are maintained to prevent shrinkage. Anti-Allergy programmes offer a unique way to remove pollen, dust and other particles. Agitation works deep into the fibres, and thorough rinse cycles remove traces of washing powder and fabric softener. This is great if anyone in the house has sensitive skin, hay fever or asthma as it removes 99.9% of major allergens – it has even been awarded the Allergy UK Seal of Approval. It’s an unavoidable fact that accidents happen – especially when kids are around. Hotpoint’s unique Anti-Stain function is there to save your garments from 20 of the most stubborn stains, without the need to pre-wash.
Other cleaning options include Delicates, Shirts and Fast Wash cycles. This model is also available in a graphite finish. Hotpoint’s WMEUF743P features programmes for everyday use and helps to keep utility bills down. Order yours today.